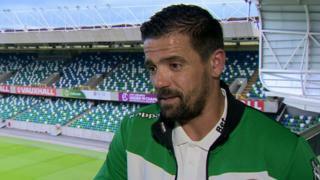 A Belfast football club has said it is “disgusted” that footballer Nacho Novo was subjected to “vile sectarian abuse” while he was their guest in the city. The taunting and the confrontation were both filmed and posted on social media. Novo had travelled to the city to attend East Belfast FC academy’s prize-giving day for players aged 11 and 12. In a statement to BBC News NI, a spokesman for the academy said: “We are disgusted and angry that Nacho was subjected to a barrage of vile sectarian abuse. The former Rangers striker, who spent six years with the Glasgow club, suffered a suspected heart attack earlier this year after playing at a tournament for Rangers Legends in Berlin. During the incidents at Belfast International Airport at the weekend, Novo was filmed walking through the airport while the Celtic fan taunted him. The Spaniard initially smiled and appeared to laugh it off, but an angry Novo later confronted the fan outside the airport doors, swearing and demanding to know why he had been “disrespected”. The East Belfast FC academy pointed out that the Spanish star was targeted after travelling to another country to attend a cross-community youth event. “Our young players had a fantastic day with Nacho as part of our exciting academy development plans,” their statement said. The club called on the Police Service of Northern Ireland to investigate the matter. Nacho Novo is no stranger to the city, having played one season for east Belfast club Glentoran in 2016-17. During his time in Belfast, Novo was also warned by police that he was under a death threat from dissident republicans. In addition to his time with Rangers, Novo also played with teams in the US, Poland and his native Spain. Next articleWhat US sanctions against Iran will snap back on Tuesday?